Well, Ben & Jerry’s is at it again this summer, and so was I. 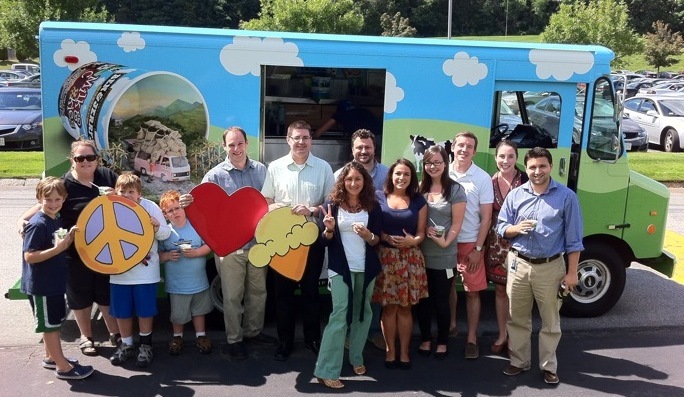 All month long, I’ve been tweeting at @benjerrystruck to get them to come to our office, and Monday, when I saw that they’d be in Waltham and Lexington a day later, I really stepped up my efforts, enlisting the entire office to tweet and get the truck to come our way. Late Monday evening I received confirmation that our efforts would be rewarded, and Tuesday afternoon, the truck arrived. Hundreds of my coworkers enjoyed delicious Americone Dream scooped fresh from the truck, and others got cups of Cookie Dough, Cherry Garcia, and other flavors. It was a perfect day: Meeting-free (for some folks, anyway), gorgeous weather … and free Ben & Jerry’s. And I’ll remind you, this all came about because of Twitter. For the small “price” of a few tweets saying how much I (and others) love Ben & Jerry’s, we got lots of free ice cream. 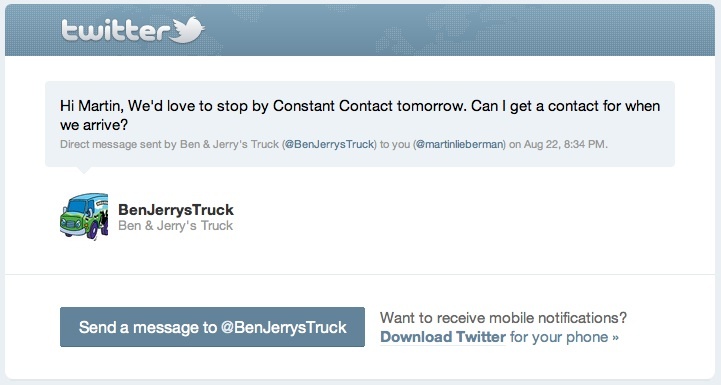 Ben & Jerry’s got lots of “free” marketing and exposure, and generated lots of goodwill for its brand. It was a win-win for everyone involved. Between the ice cream and Pretzel Crisps, plus good relationships I’ve developed, plenty of connections I’ve made, lots of information I’ve learned, and fun times I’ve had, I’d say Twitter’s been very good to me. If you’re not using it, I still say you’re missing out.